ROME — Having recently lost his starting job for Italy, Ciro Immobile remains a constant scoring threat in Serie A. "We needed a reaction after the ugly performance against Inter and I'm just pleased that I could help the squad when we really needed it," Immobile said. Immobile's brace gave him eight goals for the season, good for second in the league behind Genoa's Krzysztof Piatek. Immobile was joint top scorer with Inter Milan's Mauro Icardi last season, with 29 goals apiece. He also led the league with 22 goals for Torino in 2013-14. With Italy, though, Immobile has gone scoreless for more than a year, contributing to the Azzurri's failure to qualify for the World Cup. He also failed to make an impact at the 2014 World Cup after his breakout season with Torino. "(Italy coach Roberto) Mancini knows me and has always called me up," Immobile said. "There are always choices to make but I'm always available." 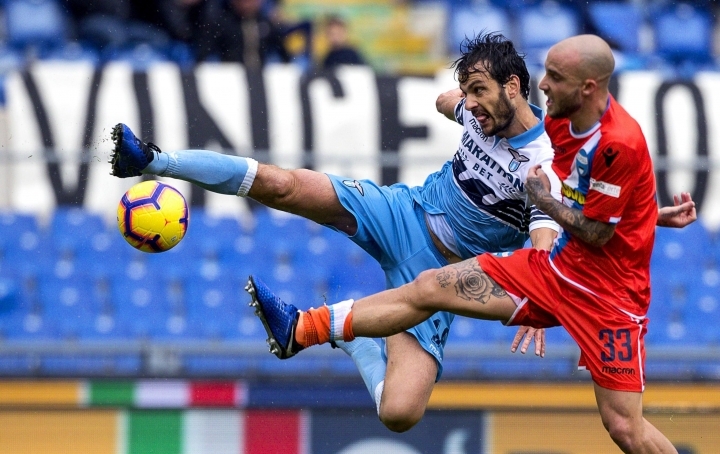 Lazio moved back into fourth place, three points ahead of AC Milan, which played at Udinese later Sunday. "I want to dedicate the goals to my wife, who always follows me, even to away games, and to tell her that I love her very much," Immobile said in an impromptu dedication at the end of an on-pitch interview. Torino goalkeeper Salvatore Sirigu has saved four out of five penalties since the start of 2018 in Serie A — the best rate in Europe's top five leagues. However, Fabio Quagliarella turned in the rebound from Sirigu's save for Sampdoria's only goal in a 4-1 loss to Torino. Sirigu is competing with AC Milan's Gianluigi Donnarumma for the starting job with Italy.